Most parents recognize the advantage to teaching their children responsibility and teamwork. A great way to do that is to develop a list of chores for kids to do around the house. As families get busier and busier, we all have many demands on our time. Spending time with your kids while teaching them to help out as part of the family is time well-spent. 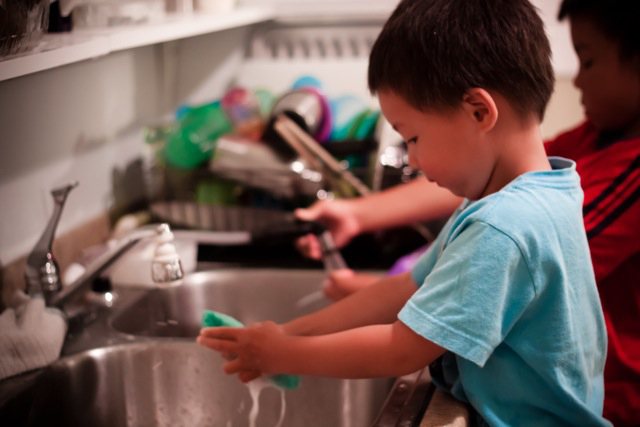 If you have more than one child, separate the chores for kids by age. Not all jobs will work for all ages. When trying to make a list of chores for kids to do, there are some things to remember. Start early and make it fun. Don’t make the mistake of thinking that your kids are too young to help out around the house. Children as young as two or three can learn to do their part. Teach them how to accomplish the task, and don’t expect perfection. Recognize that little kids will not do the same quality of work that you would, but that’s okay. You are teaching valuable lessons that your kids will carry through adulthood. Praise the work they do and encourage them. Chores for kids don’t have to be a battle between the big people and the little people. Check the lists below and let the kids help out! Pick up their own toys: Kids can learn at a very young age to have responsibility for their own stuff. Make it a game and they will be doing chores for fun. Try singing a song and see if all of the toys can be in the toy box by the time the song is finished. Wipe up messes: Sponges can be fun playthings as well as being a cleaning tool. Let your toddlers be in charge of wiping up spills or wiping the table after meal time. Feed your pets: Animals are a great joy as well as a great responsibility. Filling up the food dish for your cat or dog is an important job that has the added benefit of teaching a little bit about measuring. Help with meal prep: One of the best chores for kids to do is to take part in meal preparation. Adding chopped vegetables to the salad bowl or measuring and pouring ingredients is fun. These kitchen chores for kids are excellent for all ages. Fold towels: Laundry is a great place to start when assigning chores for kids. Folding towels and washcloths is pretty easy. Sorting socks can be a matching game. If you have a SockSync, your kids may not even realize they are doing a chore. It is more like a memory game played with socks. Empty wastebaskets: Taking small bags of trash out to the garbage cans is an age-appropriate job for little helpers. It is also an important job. Nobody likes those overflowing garbage cans. Make their bed: Don’t expect hospital corners on the bed, but this is a great age to begin learning how to straighten the blankets and make the bed. When the bed is made, the whole room looks neater. Wash the easy stuff: Plastic cups and bowls are safe for little hands. What kid wouldn’t enjoy a sponge, some water, and a bunch of suds? Dish-washing can be another job that doesn’t seem like a job at all. Set the table: Not everybody takes the time to set the table anymore. Even if you only do it once in a while, table-setting is an excellent and age-appropriate chore. Teach your kids how and they will be able to help when you have company over. Kids love to show off their new skills. Clear the table: Scraping plates and putting them in the sink or the dishwasher is easily handled at this age. Don’t let them handle sharp knives quite yet; you will want them to keep all of their fingers for future chores! Raking leaves: Yard work teaches kids to take pride in their home as others see it. A nice, neat yard looks good, and the kids will be proud when they can see the benefits of a job well done. All of the above: Just because a child could handle a job at three years old doesn’t mean they have outgrown it at six. The older they get, the better the skill set will become. Vacuuming: Most vacuum cleaners are pretty easy to operate. Older children are capable of doing this job very well. Hand-held vacuums can be used on the stairs or even to clean out the car. A fresh vacuuming can perk up the look of a room in a hurry. Washing the car: Again, water, sponges, and bubbles are a winning combination. All kids will have fun helping to wash the car, but when an eight year old or older child washes the car, it will actually get clean. Starting the washing machine: One of the best life skills you can teach your child is how to do the laundry. Sorting colors, adding the soap, and then starting the machine are well within the capabilities of kids this age. Cooking: Care must be taken when kids are working in the kitchen, but all children should be taught to cook. An eight-year-old can scramble eggs, and a 12-year-old should be able to handle a simple meal. Not all chores for kids to do around the house have to feel like work. Remember the fun factor. If you treat household chores as fun, your kids won’t feel punished when you require them to help out. Assign chores for kids by age as well as by ability. This list is just a brief guideline of some of the things that kids may be ready to do at each age level. Use your own best judgment because no one knows your children as well as you. Happy housework!